It's party party in this house at the moment! After last week's 18th birthday celebrations, this week we went to a friend's 40th birthday party, which was fabulous. After buying the Belshaw fold A-line skirt from Finery (£75) for Flo's 18th, I wanted to wear it again so at least the cost per wear went down to £37.50. Hmmm. I'm not selling that. Think that I might need to work on it. Describing the top as a t-shirt doesn't do it justice as it's definitely a "blouse" or a "top" in my book. The back is really pretty too - I've put some more pictures of it below. I just wore a little bralette from M&S over the top of my bra, so that it covered the back strap - which wasn't particularly small, or lacy! I also swapped last week's spotty shoes for the Tabitha heel from Boden (£51.60 down from £129). These were meant to arrive in time for last week's party but they didn't quite make it - but at least I could wear them this week. They are a little marmite - and have a slight equestrian feel about them one might argue but I like them and they are hugely comfortable. This is our kitchen (on a tidy day!) To put it into context, this Ikea kitchen had just been installed when we moved into our house 12 years ago now. When the house was renovated (which was just before we moved in) what had previously been a car port was turned into the kitchen, which runs the length of the house. Having had the work done on the back of the house last year, we needed to do a bit of tweaking to the kitchen. The trouble was that most of the kitchen was still fine. We didn't want to replace the work surfaces as we liked them and I think they were quite pricey. Plus anything that we replaced them with would be of an inferior quality. Nor did we want to risk moving the huge surface over the island, as no-one could guarantee that it wouldn't crack. To get the kitchen decorated. Now you know what a fan I am of making things up as I go along. Well that's what's happening with the kitchen too - other than the design of the cupboards which clearly had to be decided upon in advance. The things that are still up in the air are - the colour of the replacement kitchen doors, the colour of the paint and whether to paper one the big wall opposite the kitchen island or not. The one thing that have been decided upon are the tiles. Remember the round the houses comment from earlier? Well that applies to the tiles too. 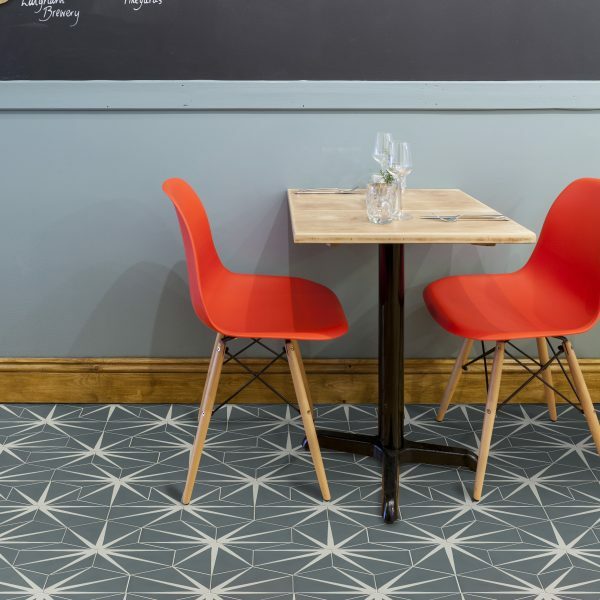 These are the sort of encaustic tiles that I really love. This photograph was taken in Guernsey last year at newly opened restaurant. 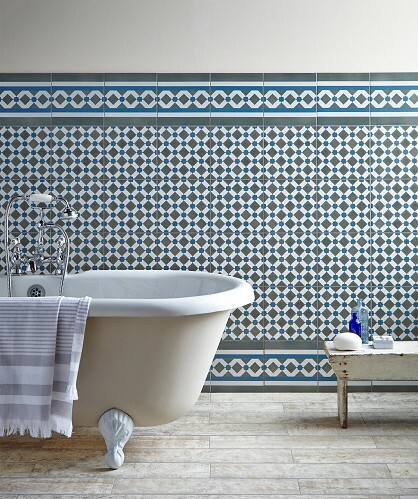 So the search for something similar began, albeit for the walls. 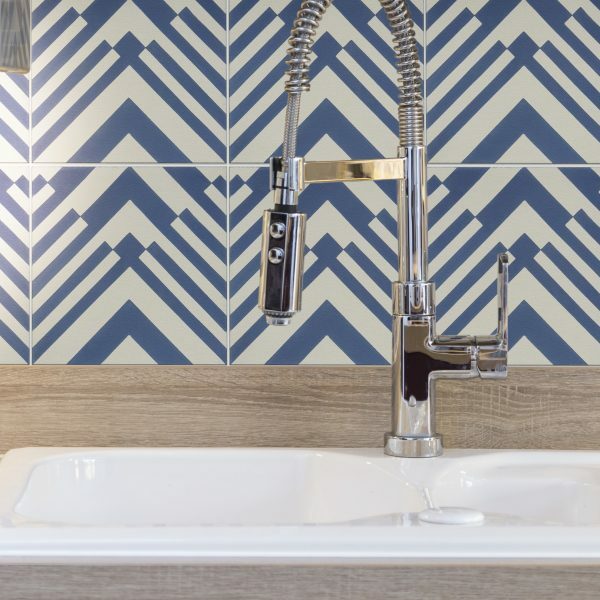 Tiles are pricey! I loved the Fired Earth tiles (who doesn't)? 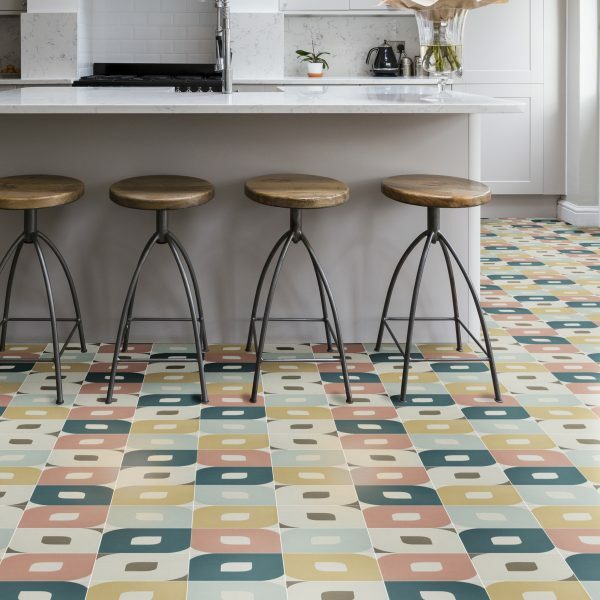 In particular the colours in the Toulouse range really appealed to me but at £168.53/metre they were probably more than we wanted to pay. Plus at only 20cm x 20cm there would have been a lot of tiles in quite a small space, which could have looked a little "bitty". And they failed to send a sample to me. Tut tut. The Berkley also featured in my deliberations but as it too was 45cmx45cm, it was too tall for the space. ..but the family gave them the thumbs down. 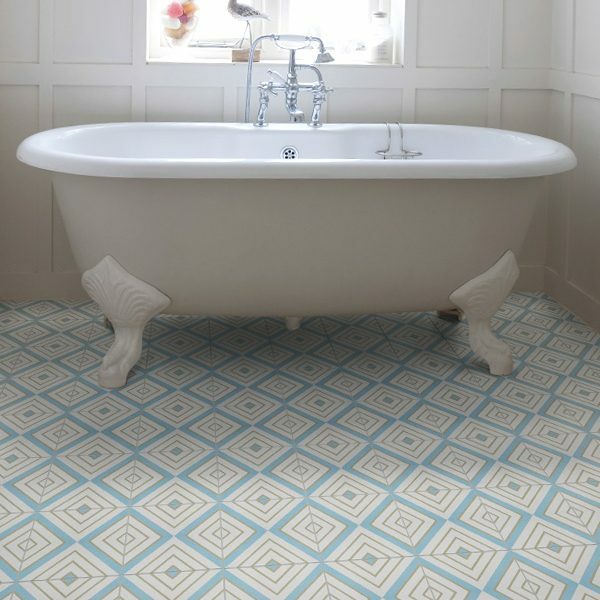 However the shape of the tiles really appealed and at 20cm x 50cm they were the perfect size. So what to do? Keep on looking of course. 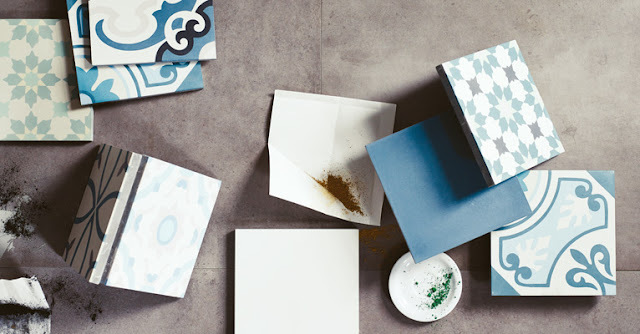 Well next I found another brand that I liked - Ca Pietre. 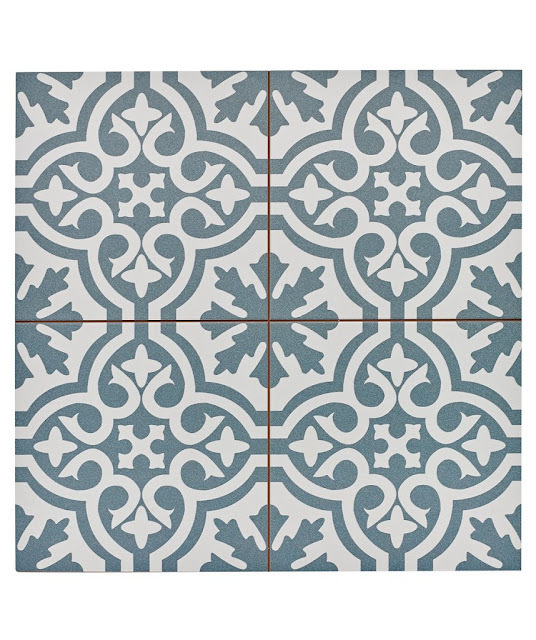 I've linked to the patterned encaustic tiles because there are some great choices. These are some of my favourite designs (from top to bottom, mixed eye, Darcy, Lily pad and origami). I didn't think that the samples would reach me in time but with two bathrooms that need sorting, these are definitely on my list for future reference. 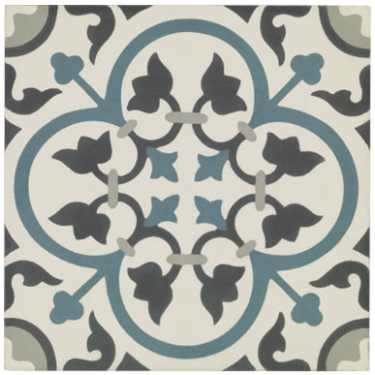 The Attingham tiles come in three different colours (mist, seagrass, powder blue), they are 45cm x15cm, cost £45 per sq metre and there are five different designs in one box (or they can just be bought plain). 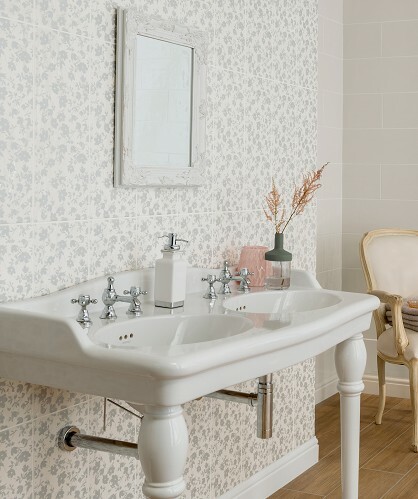 Really I'm a commitment phobe when it comes to something too distinctive - unless, like wallpaper or paint, it can be changed pretty easily. So I get that these seem a bit boring compared to the encaustic ones but they are tried and tested. 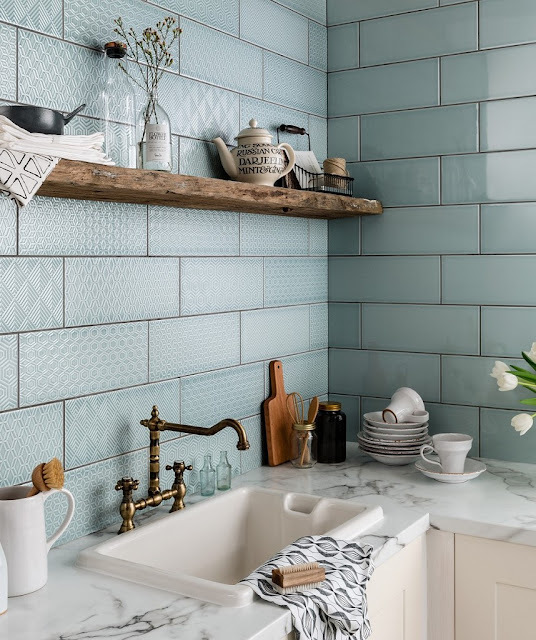 I have to say that if I never see another tile in my life, I really won't mind. Maybe Mr SG can choose the bathroom ones instead. Some of it is autobiographical but most is in anticipation of what is yet to come. I think that my point is that whatever is happening on the outside, it's what's on the inside that counts. The only real measures that I take against ageing are trying to eat well, to get plenty of exercise and sleep, to drink lots of water and not shut my mind to new possibilities. Other than that I don't do much but it is a debate that I do have with myself from time to time. Anyway, hopefully it make you smile (a little). Have a super weekend! cannot solely be attributed to those I have reared. I think about not dying it. But I'm not ready for that…maybe one day. No, it’s just my droopy mouth. Or should I grow old gracefully? Why am I looking in the fridge? And why have I come up the stairs? But she has wrinkles and saggy eyes. Oh no! SERIOUSLY? So what keeps you young? Well it wasn't strictly my 18th birthday party was it? No, of course it wasn't. That was nearly 29 years ago now. (Oh flip, can I swear a little please?) And the fact that it was our daughter's 18th birthday party only serves to reinforce just how old I feel. How can that have happened? How can she be 18? I can remember the cheese and ham sarnie that my husband made for me when I came home from the hospital with her so clearly. I swear that it was the best food I've ever tasted. No Michelin starred restaurant can ever compete with that. So what to wear to a party with 50, 18 year olds in attendance? Well my first rule was a lot. As in a lot of coverage was required. No legs, no cleavage, no back or arms on display. And definitely no mid-riff. Secondly, nothing from Topshop, H&M, Reiss etc. Nope, I had to head to a brand that no 18 year old would shop at. And any "fun" stuff had to be on the fringes - so nails, ear-rings, shoes etc, that was the place to have the fun stuff. Other than that I decided to keep things plain but with a bit of colour. Well this was an easy top given the name of our daughter - the Florence jersey top from Finery (£39). 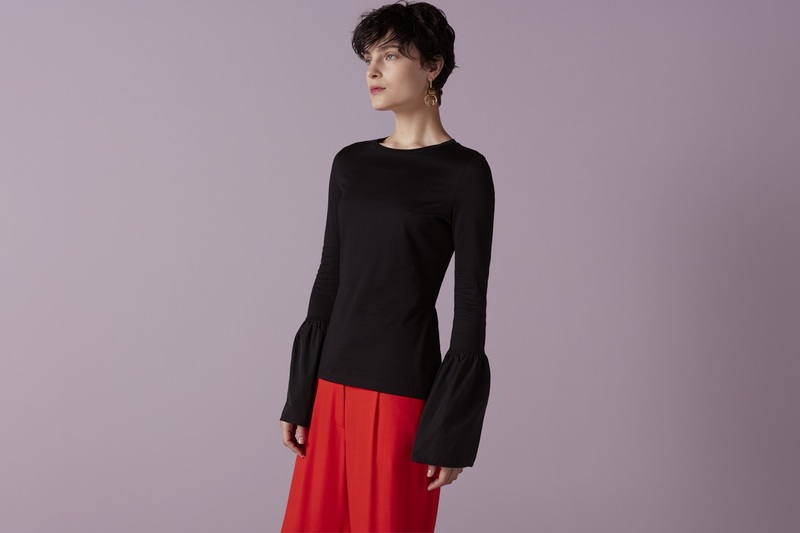 This is the most brilliant top if you fancy a fancy sleeve but you don't want to dip it in your soup or catch it in the dishwasher or end up with toothpaste all over it. The fancy bit is made of a fabric which is a) wipe clean and b) which you can fold back and it will stay there. Double result. And I also wore this Belshaw skirt from Finery (£75). I'm a big fan of a statement skirt and a top as it's so versatile. 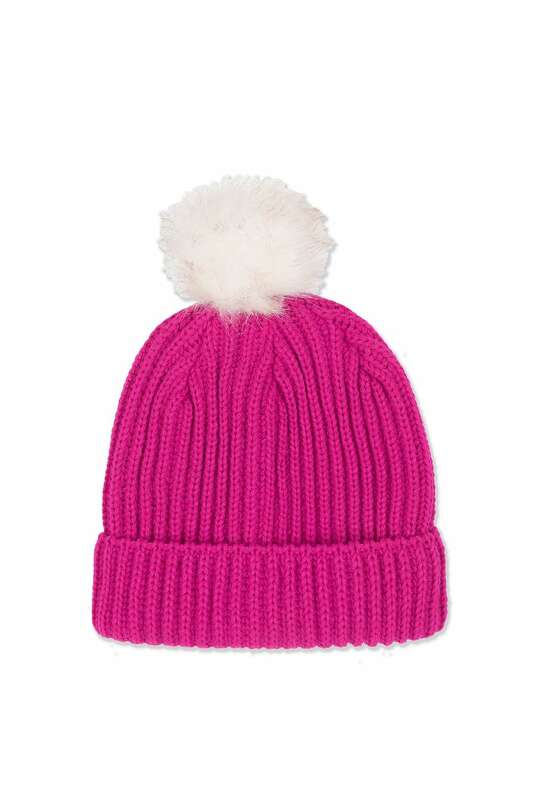 And of course the pink had my name written all over it. I also ordered the zebra jacquard skirt which I loved but the colour against my bare legs wasn't great - so that will be going back. It's a great option though for anyone on the look out for a funky printed midi skirt. Oh and I bought the bag in the Whistles sale and the shoes were a few seasons old from Aldo. There's a shoe story which I will save for another day! The party was a success and the birthday girl was really happy. Happy Birthday sweetheart! But I bought a new coat today. 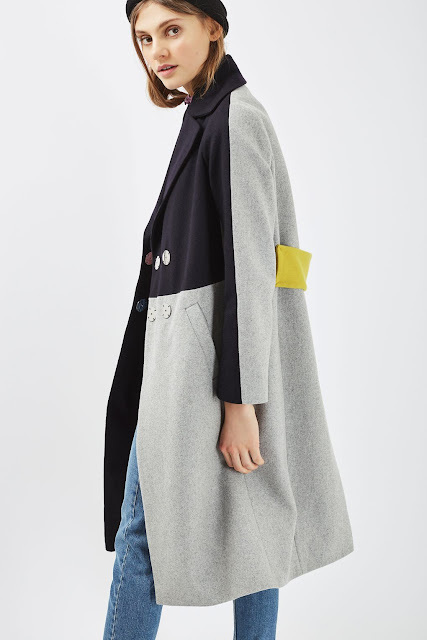 I had decided, in amongst my wardrobe musings (a post about which I started but which I have abandoned for now because it's going to take me too long) that a "sharper" coat would be a good addition to my wardrobe. A longer coat, that would make a statement and do a good job of smartening up my go-to outfit of trousers (of some description) and a jumper (of some description) that I live in during the winter. 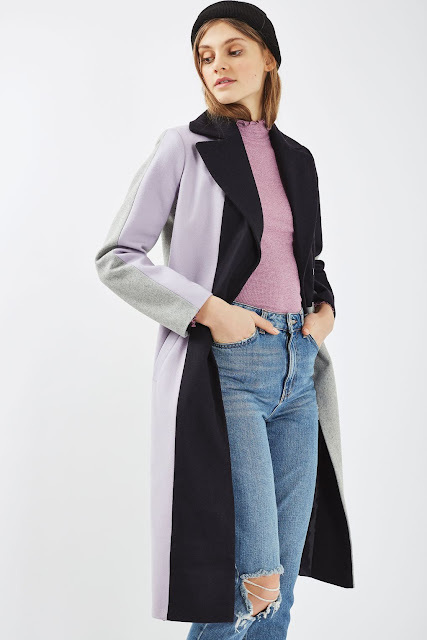 This coat first caught my eye in Topshop last week but we were on a mission to find the eldest a party dress for her 18th birthday so there was no time to stop. But then when I was back in town today it again caught my eye so I tried it on and really liked it. In an ideal world I had decided that I could do with a couple of smarter coats - maybe one grey and one navy. I was going to trawl the end of the sales to see if I could find one, or buy one a year for the next couple of years. But this ticks the grey box and the navy box, with some lilac and yellow thrown in just for good measure. I think that this is one of those marmite type of coats. Or one that people would steer clear of because they may think that it wouldn't go with everything. 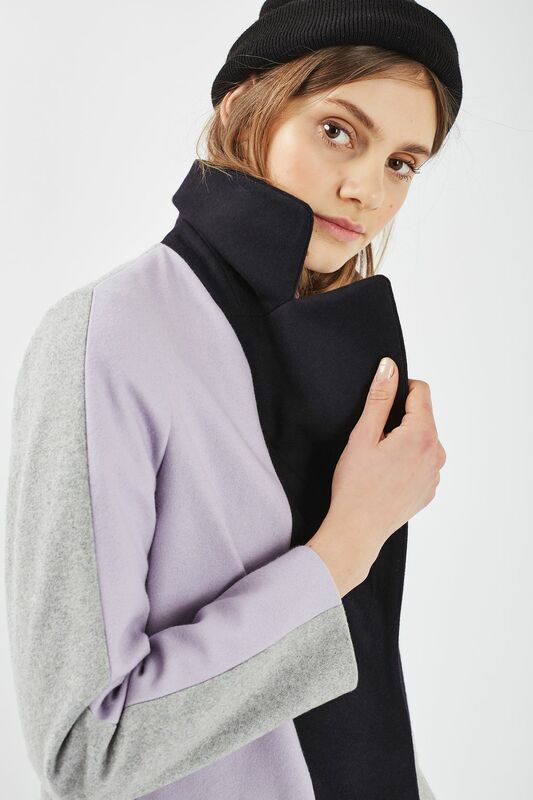 But I always think that if whatever is poking out from underneath your coat is - as mine tends to be in the winter - grey or navy, then on the whole most winter coats will work with anything and everything. As I work in fashion, I sometimes wonder to what extent what is going on around me influences what I choose to wear. I also wonder what I (or any of us) would choose to wear, if left entirely to our own devices and if we weren't exposed to the likes of magazines, shows, press days, Instagram, blogs, photoshoots etc . I'm sure that, if left to my own volition, this coat would feature in my wardrobe and I haven't seen anyone wearing it yet. But then again maybe there's a reason for that! N.B. I'm waiting for mine to arrive as they didn't have my size in store. I tried a 10 which was huge so I' hoping that the 8 will be OK, although as it comes in a 4 and a 6, maybe the 8 will be a bit roomy. Needless to say both the sleeves and the length were longer on me than on the model. Is this the end of Style Guile? Golly it's been a while. And I've missed you all. But I promised myself that I wouldn't start blogging again until I had finished my list of jobs. As you might expect, I haven't reached the bottom of the list..... Do we ever? After the children went back to school, first of all there was the house to be sorted. I did a proper spring clean under the beds and on top of the cupboards. I sorted the linen cupboard, went through the children's bedrooms - and anything that got in my way went in a bin bag. Then it was the turn of the tax-return. Then trips to the charity shops, choosing tiles for the kitchen, "doing" the 9 year old's birthday, preparing for the soon-to-be-18's birthday party and with a work trip to London included for good measure, it's been hard to find a window of opportunity. But then today I received a comment asking "Is this the end of Style Guile?" Thank you to whoever left the comment because it has prompted me to get back in front of the laptop. In all honesty I think that quite a few bloggers have taken a bit of a sabbatical. After Christmas the thought of spending money in the sales makes me feel slightly nauseous and writing about spring trends makes me feel slightly shivery. People get annoyed with exercise and healthy eating posts and I figure that sometimes it's good to just sit quietly in the corner and finish the Christmas chocolate whilst contemplating the New Year's Resolutions that I've made (and broken). But with a living room to be decorated, a kitchen that's about to have work started on it, two bathrooms to replace, an outfit to be decided upon for both an 18th and a 40th birthday party, plus an offer to write about a new range of active wear, I won't be going anywhere far for a while.